Ponnur Hill Teerth Kshetra is a famous pilgrimage centre of the Jains situated in the Tiruvannamalai district of Tamil Nadu. 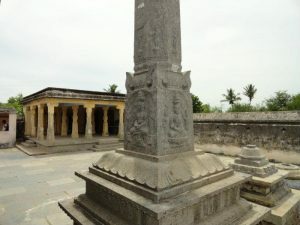 It is the holy place where the celebrated Jain monk and scholar Acharya Kundkund who belonged to the Mula Sangha monastic order of Jain monks practiced his penances. His original name was Padmanandi but he was referred to as Kundkund because he was born in a place named Kaundakunda in South India. He compiled several literary texts and devotional prayers. It is said that the great texts of the real philosophy of the world known as Dwiteeya Shruta Skandha which includes the Panch Paramagamas was written by him along with the Tirthankar Simandhar Swami and these were written at Ponnur hills. These texts motivate the pilgrims to follow the Jain principles of Right Faith, Right Knowledge and Right Conduct. The temples at Ponnur hills are very ancient and are revered and respected by all devotees. The foot images of Acharya Kundkund are present here. Apart from this there is a temple of Shri Adinath located at the foothills. The temple has beautiful architecture with sky high Spires. An idol of Lord Mahavira is also installed here carved beautifully on a flat stone. Over the head of the idol an artistic umbrella can be seen. On both sides of the idol attractive statues of Yakshas(celestial beings) have been constructed. The other temple is situated a little distance from the hills and it is dedicated to the Tirthankar Lord Ajitnath. There are some caves on Ponnur caves. Acharya Kundkund is believed to have lived here. Road: – Buses or Taxies are available from Chennai, Kanchipuram, Vellore and other places for Ponnur Hills. Train: – Chennai Railway Station is 100 km from the temple. Airport: – Chennai Airport is the closest airport to the temple. There are two dharamshalas or rest houses for the pilgrims in the temples at Ponnur hills with all the required facilities. Acharya Kundkund by his penances and spiritual practices made the place holy and sublime and pilgrims who visit the place feel the sacred vibrations which along with the scenic beauty and solitude of the place help them in their spiritual quest for self realisation and enlightenment.